Stage 8’s path from Le Tour’s evergreen town of Pau, across four categorised climbs including Cold du Tourmalet and Col de Peyresourde, will take the riders on a journey of 184km to the finish at Bagères-de-Luchon. Taking in the HC Category ascent of the Tourmalet and then the Category 1 Peyresourde, today is anticipated to wear down the big name contenders ahead of the following day’s first summit finish of 2016. Today will be an explosive affair, but whether or not we will see the favourites come to the fore is hard to predict. Dan Martin is a fan of this area and certainly looks strong enough to perform well on this type of terrain. With a downhill run into the finish, the Irishman will be aware that a single well timed attack could set him up for the stage win. Martin could potentially struggle in regards to team support here, though we have often seen him match the general classification favourites with limited assistance at grand tours. If an elite group makes it to the finale however, then Martin will be a tough man to beat in a sprint finish, his turn of pace often underestimated by rivals. Alejandro Valverde will share in the hopes of Dan Martin as to how the race will be ridden, as the Spanish veteran shall be confident of stealing victory here as part of an elite group which reaches the finish first. Movistar are certainly focused upon protecting leader Nairo Quitana, the Colombian rider looking extremely strong right now, so will not wish to risk exposing him to attacks in an attempt to aid Valverde’s stage winning pursuits too much. 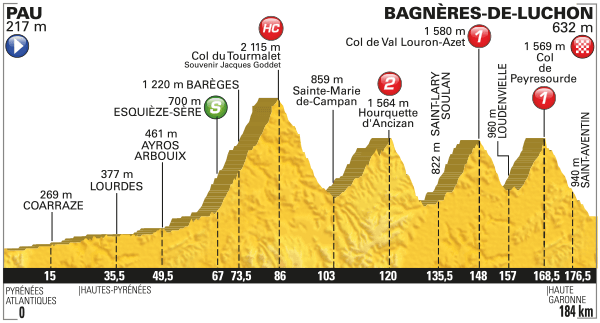 Romain Bardet was our bet for yesterday, but today offers similar opportunities for the Frenchman to attack over the day’s toughest climb and attempt to solo his way to the finish by utilising his fantastic descending abilities. His AG2R teammates will want to compensate for yesterday’s failed attempts to set him up for the win and he certainly stands out as a man to watch. Rafa Majka has won the polka dot jersey already at Le Tour de France by putting in brilliant performances on days like these. The Polish rider is certain to have had his head turned by today’s offerings and will be a difficult rival to dislodge for any rider alongside him in the day’s breakaway. Potential breakaway riders worth keeping an eye upon: Serge Pauwels, Ilnur Zakarin, Thomas Voeckler and Eduardo Sepúlveda. Posted on July 9, 2016 July 23, 2016 by Spokenforks	This entry was posted in Le Tour de France, Le Tour de France 2016, News and tagged 2016, Alejandro Valverde, Col de Peyresourde, Col du Tourmalet, Dan Martin, Eduardo Sepúlveda, Ilnur Zakarin, Rafal Majka, Romain Bardet, Serge Pauwels, Thomas Voeckler, Tour De France, Tour de France Stage 8 Preview. Bookmark the permalink.